Bring 2-quart water to a rapid boil. Add cleaned spinach and let it cook for 1 minute in boiling water without cover. Remove from heat. Drain and rinse in cold water. Drain again. Divide spinach in two small flat-bottom bowls and squeeze out the remaining water by using your fist against the spinach. Flip both bowls onto desired the serving plate respectively. Reuse these two small bowls to hold the sauce ingredients. One bowl for one serving, or you can double the sauce ingredients, stir together in one bowl, then divide into two portions. 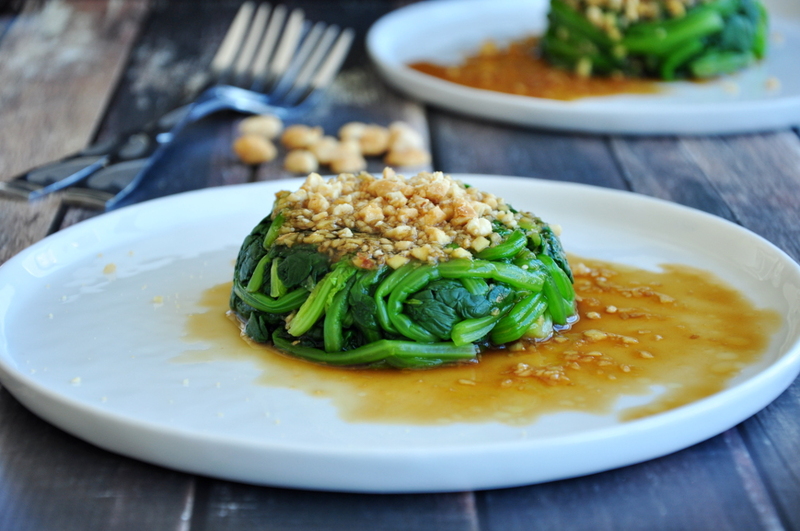 Pour each serving of sauce over each prepared spinach. Sprinkle chopped peanuts and serve!! Ginger and oyster sauce, add brown sugar, garlic, soy sauce and sesame oil. (I know, it’s totally Asian!) 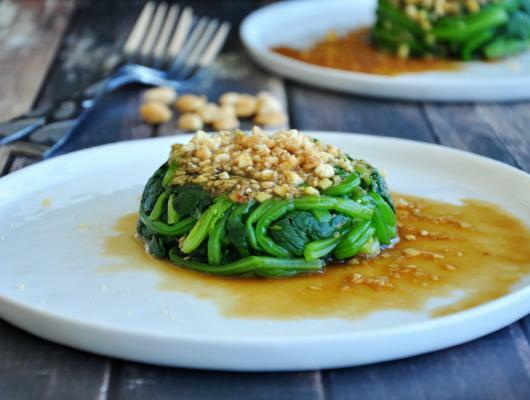 Combine everything with chicken broth and pour onto the prepared spinach. Easy!